Backups work best when you have multiple copies, at least one of which is both current and offsite. OS X’s Time Machine feature plus high-capacity, low-cost hard drives make it possible to back up regularly and to rotate drives through backup sets and store a full backup somewhere away from the data that’s on it. But what about when the worst happens? When fire strikes, a lightning bolt fries your computers and backup drives, or a burglar runs away with the goods? A drive stored offsite helps—but the files stored on it are out of date the second it’s unplugged and lugged away. An online backup service can be the perfect addition to your backup plan. With large amounts of storage and faster Internet connections, backing up your files online has become more viable. These hosted backup providers can also add depth to your archives, since most of them store data in such a way that you can retrieve several—or even several hundred—previous versions of a modified file. 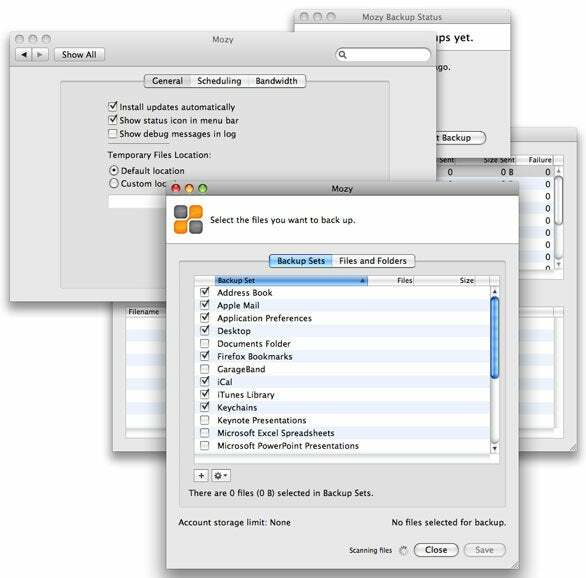 Here’s a look at seven services with OS X software to manage automated backups. Testing a slew of online backup services isn’t for the fainthearted. Using a Comcast Internet connection that’s described as 15 Mbps downstream and 2 Mbps upstream, but frequently provides far higher rates, we installed each of the software packages and selected at least 10GB of files to back up, up to 100GB in some cases. We used the services for a few weeks (in the case of Mozy and CrashPlan, I had been using the services for years and months, respectively, and examined large current backup sets as well as performing additional tests) and tested restoring backed up files as well. The services store your data on massive server farms that might have hundreds or thousands of terabytes of storage. Companies provide few details on their Web sites about where and how they store data. Jungle Disk is unique in relying on cloud-based metered storage, with a choice between parent company Rackspace and Amazon’s Simple Storage Service (S3). After the initial backup, the services are clever about sending changes. Rather than uploading a 10 MB file again—or even a 10KB one—the software on your computer breaks a file into pieces, and then creates a mathematical summary of each piece. That summary is compared to what’s stored on the server, and only changed or new pieces are transferred. Finally, include all the files you want. By staging backups (and making a local full archive or clone), you can be sure that you aren’t still backing up initial files weeks in and lose some important changes. On the negative side, online backups suffer from moderate to long delays in restores; without personal encryption password, the compromise of company or a government subpoena could reveal private data; are far more expensive over the course of a year than local backups; and a company’s sudden demise could render your current and archival backups permanently unreachable. Flat-rate services charge a per-computer rate paired with unlimited storage, while metered services allow unlimited computers to have pooled data. iDrive is an exception—it offers 150GB storage for up to five computers for a flat monthly rate. Mozy scatters parts of its functions across several independent floating windows and programs, including the critical tasks of file selection and restore, and adds in a system preference pane to boot. SpiderOak’s colorful front end looks nothing like a Mac app. In iDrive, one menu reads Backup-Restore and contains two menu items—Backup and Restore. Clicking on buttons in the main window might change the display or bring up an informational message with no options. Jungle Disk, with the most fine-grained settings, has well-written explanations, but a design entirely its own. Although we don’t look for “pretty” in a program, we do value how quickly we can recognize and perform a task, how accurately that task is carried out, and how well we can repeat a task without having to relearn new behavior. CrashPlan, Backblaze, and Carbonite succeed best at hiding complexity behind a simple interface (although Backblaze and Carbonite have other significant limitations). Several services also let you back up any network-mounted volume that’s available via the Desktop. Flat-rate services except CrashPlan won’t let you back up such volumes; iDrive, JungleDisk, and SpiderOak allow it. Jungle Disk and SpiderOak require that you navigate to the /Volumes directory to reach networked drives, a seemingly unnecessary step instead of showing those drives as available sources. Mozy appears to be unique in using Spotlight both for preset selection options (such as all your applications’ preferences) and allowing new selections based on a Spotlight search. Upstream Internet bandwidth is a scarce commodity, as is computers’ computational power. The software we tested all allow various measures of throttling upstream (and sometimes downstream) bandwidth use, but most have poor controls over scheduling active times for backups. As with other factors, no two backup packages offer the same options. And unlike desktop backup software, with the exception of Jungle Disk, you can’t schedule different sets of backup files if you wanted, say, a critical set of folders to be archived every four hours, while music and movies are uploaded only on weekends. This is a terrible omission, having been available for local backups since at least the early 1990s. Jungle Disk lets you set up multiple backup volumes, as well as multiple backup sets and schedules for each volume. No package lets you set what should be a perfectly common and reasonable schedule: back up outside work hours and on weekends for office systems, and back up during work hours and overnight at home. SpiderOak lets you set days of the week, but the schedule is the same for each, including no stop time. With Jungle Disk, you could set up multiple identical backup sets with different schedules to achieve the effect. 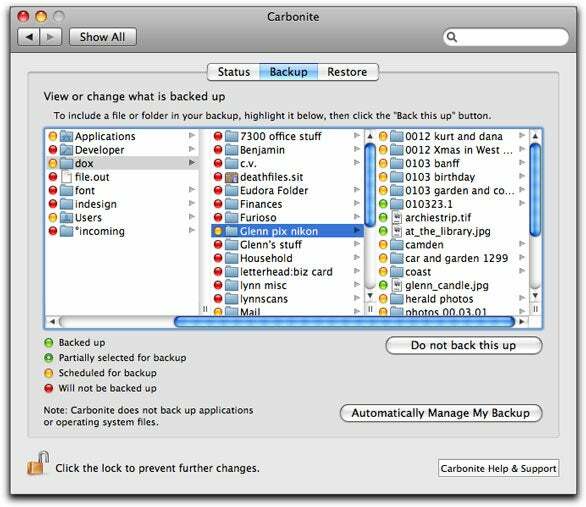 Carbonite lacks the ability to schedule backups, and Backblaze can't set an end time; neither monitors a Mac for activity. Carbonite automatically throttles back its efforts when the computer is in use, but you can't change its notion of what in use means. Both Backblaze and Carbonite can be set to a vague lower-priority mode, too. SpiderOak only lets you specific a start time, but not a stop time. Backblaze has the unique option of testing your connection via its Web site, which then reports the maximum amount of data that you could send per day at the current unthrottled rate. In my case, at the time I tested, it was 13GB. This should be de rigueur for all backup services, since it requires little effort and improves a customer’s understanding of how to plan backups. Most services show a status bar or window with progress and an estimate of time remaining. The other four services let you set a specific network speed for uploading files and blocks; Jungle Disk lets you set the downstream rate as well. 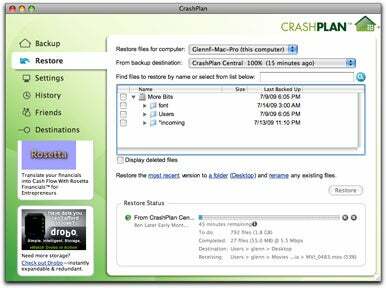 CrashPlan can halt backups, running only during a specified period, while iDrive and Mozy can throttle to a very low rate during idle times, but you can’t choose to halt backups. All of the services have large to moderate room for improvement in scheduling. Filling a broadband pipe during the wrong time, while leaving it empty during idle times, defeats the purpose of Internet backups. Providing a simple structure, allowing multiple entries to tie backup sets to times of day and throughput speeds, would dramatically enhance each package.